Rushdie’s eighth novel, which was commissioned for a recent literary festival held in The Netherlands, is an intensely personal and surpassingly odd performance that bears only incidental resemblance to his recent successes (The Ground Beneath Her Feet, 1999, etc.). Protagonist Malik Solanka is a 50ish “retired historian of ideas” who’s living in contemporary Manhattan, having left his American (second) wife and young son in London. Malik is wealthy, thanks to profiting obscenely from the commercial success of the “Little Brain” doll, a product spin-off from a popular TV series (also Malik’s creation) in which “Great Minds” dolls engaged historical wise men in fictional dialogues. If that sounds like a stretch, wait till you get a load of such thematically burdened secondary characters as Malik’s feisty mistress Mila Milo (an activist intellectual out to save the world), his secretive sloe-eyed new love Neela Mahendra, and his friend Jack Rhinehart, a dusky former war correspondent who emulates his obvious model Hemingway in more ways than one. The story’s ostensible premise is Malik’s wary détente with the furies (including the classical personified ones, an uncaught serial killer of young women, and the resentful energies of indigent societies) that he sees all around him. But it’s really a framework on which to hang fusillades of commentary on such topical ephemera as the film Gladiator, the newsworthy doings of Elian Gonzalez, Monica Lewinsky, Slobodan Milosevic, Tiger Woods, and others; “George W. Gush’s boredom and Al Bore’s gush,” and anything else that catches Malik’s jaundiced eye. It all reads like a slightly more exotic Saul Bellow novel (there are explicit echoes of both Herzog and Mr. Sammler’s Planet), with perhaps a soupçon of Philip Roth’s angry comedies of waning sexual impulses waxing eloquent. Malik is a very fully realized character, and Fury positively vibrates with intellectual energy (it’s also frequently quite funny). 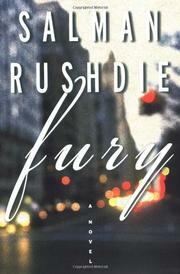 But it’s still more tirade than novel: Rushdie’s weakest book since his (justly) forgotten first novel (Grimus, 1976).